The county of Effingham population is estimated at 34,000 per www.census.gov. The city of Effingham has a population of 12,400. Includes Cities/Towns: Altamont, Beecher City, Dieterich, Edgewood, Effingham, Mason, Montrose, Shumway, Teutopolis, Watson. Effingham County has many parks and a local TREC trail that provides walking, running and biking opportunities. We also have Ballard Nature Center that offers hiking, along with an informational visitors' center and a variety of restaurants and shopping options. 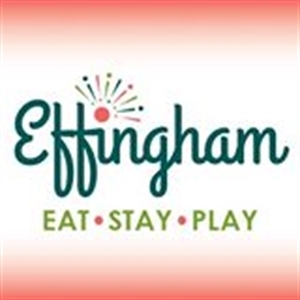 Effingham County has an Artisan Fair that takes place in downtown Effingham. The Effingham Performance Center hosts a variety of shows ranging from family events to big name celebrities. Visit www.the-epc.org, for a full list of performers. Jan 20.0 F° 28.0 F° 36.0 F° 2.9 "
Feb 23.0 F° 32.0 F° 41.0 F° 2.8 "
Mar 32.0 F° 42.0 F° 52.0 F° 3.3 "
Apr 42.0 F° 53.5 F° 65.0 F° 4.0 "
May 53.0 F° 63.5 F° 74.0 F° 5.3 "
Jun 62.0 F° 73.0 F° 84.0 F° 4.5 "
Jul 66.0 F° 76.5 F° 87.0 F° 4.4 "
Aug 64.0 F° 75.0 F° 86.0 F° 2.8 "
Sep 55.0 F° 67.5 F° 80.0 F° 3.0 "
Oct 44.0 F° 55.5 F° 67.0 F° 3.6 "
Nov 34.0 F° 44.0 F° 54.0 F° 4.1 "
Dec 23.0 F° 31.5 F° 40.0 F° 3.2 "
Spring temperatures are cool with averages in the low 50's and highs in the low 60's. Nights are cold with lows in the low 40's. Summer temperatures are mild with averages in the mid 70's and highs in the mid 80's. Nights are cool with lows in the low 60's. Fall temperatures are cool with averages in the mid 50's and highs in the mid 60's. Nights are cold with lows in the mid 40's. Winter temperatures are cold with averages in the low 30's and highs in the upper 30's. Nights are cold with lows in the low 20's. Volunteers are needed at many of our local churches, the hospital, the Chamber of Commerce, and many other charitable organizations in the area.